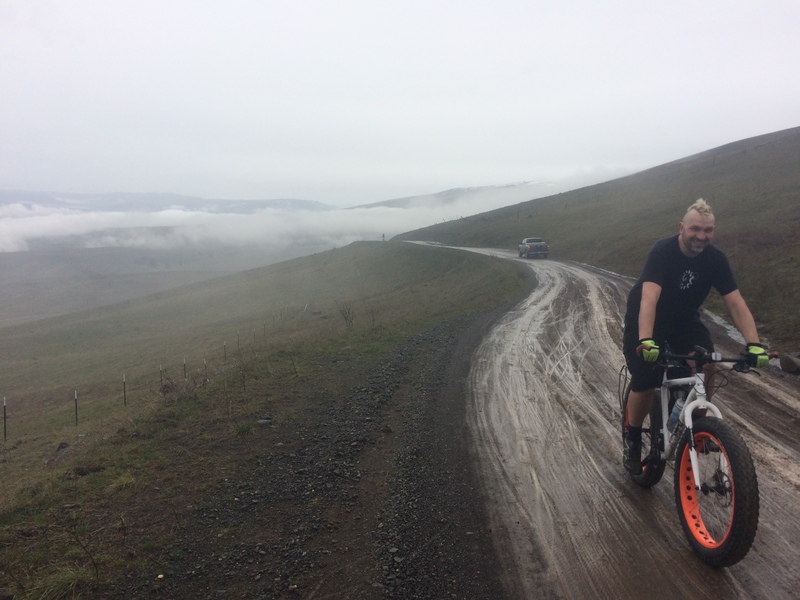 Pixie and I just stumbled our way through the amazing and muddy experience called the Dalles Mountain 60. 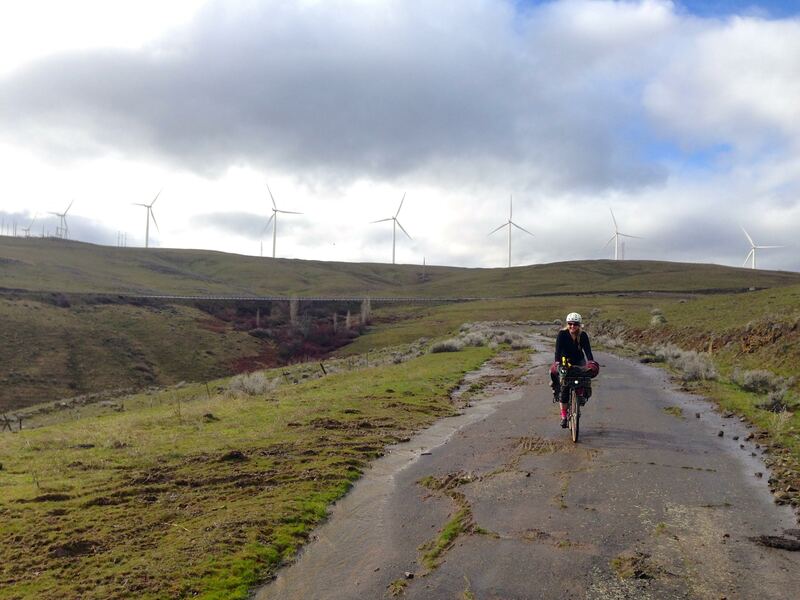 It’s ridden the 2nd Saturday in March, 10:00 a.m. roll-out from Holsteins Coffee in The Dalles. This is the classic ride that started it all. By today’s standards it’s on the tame side, but that’s why this is a perfect introduction into the wide world of dirt & gravel riding. Take your road bike and learn how to pick a line through loose gravel. 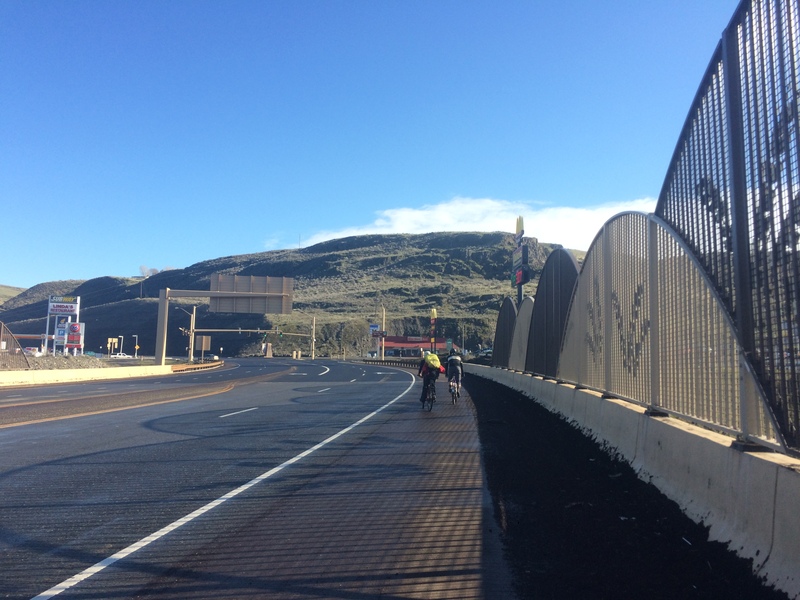 Just keep an eye on the weather, as winds in the gorge can make this a suffer fest and the beautiful climb up Dalles Mountain bakes in the sun (a great thing come winter time). 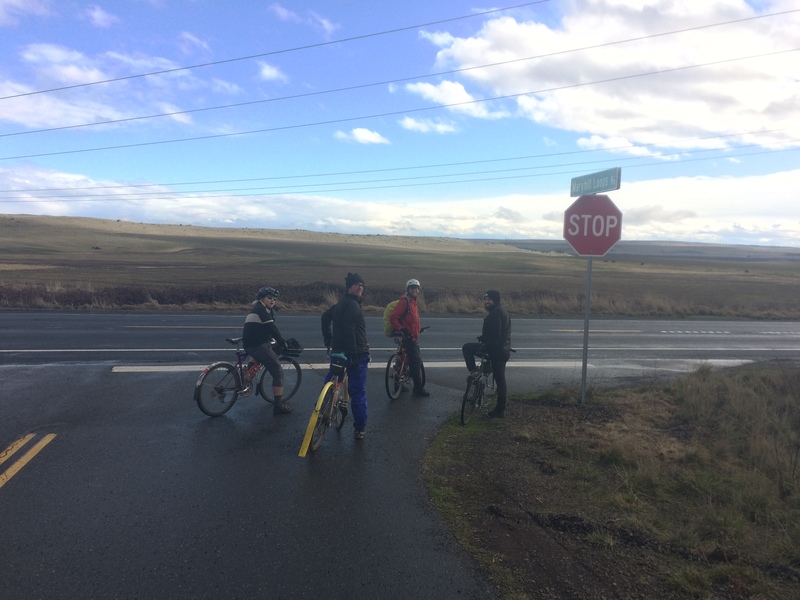 Warning: access to the top of the Maryhill Loops is private property… The alternate is to drop down US-97, West/left on WA-14 ~1 mile, then right at the road for Stonehenge. I was really slow–here’s my Strava: 57.1 miles, 3,970 feet elevation, elapsed time 8:58:46, moving time 6:00:58. 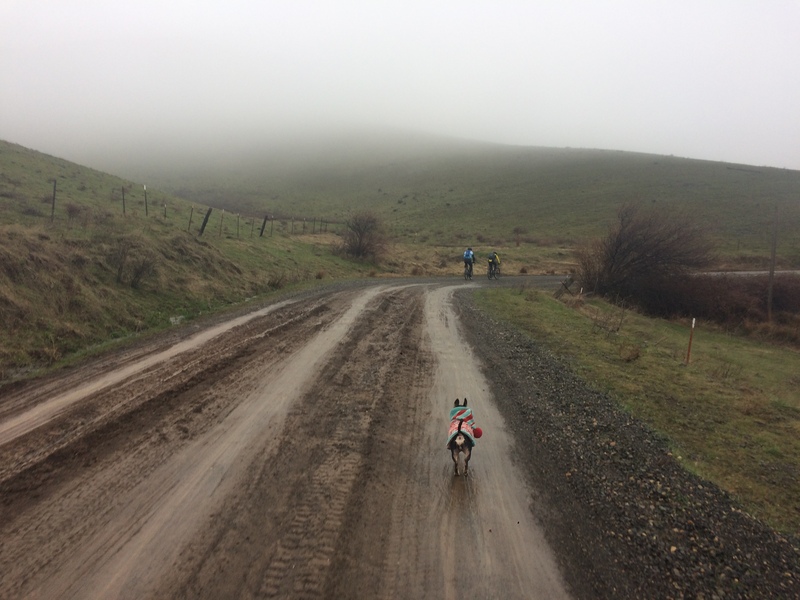 I knew going in that most people would ride cyclocross and road bikes and treat this like a race (or “sufferfest”); I’m pretty sure Pixie was the only dog along, I may have had the only bike with a kickstand, and my bike was loaded too heavy for me to lift…but it was great! We arrived at Holstein’s Coffee Co five minutes late and most of the 100 riders had already departed. This was fine by me because I probably would have felt a bit intimidated seeing all the Portland people on fancy fast bikes in more “serious” bike clothing. I’m curious how the fast people did temperature-wise. I was never too cold. And I had panniers to stow all my layers in during my spells of overheating. So there’s something to be said for a heavy bike and storage. One friend went out with only one of his two pairs of gloves and had to stop for a long time in Biggs Junction to thaw out. The first gravel started about six miles in and started as a nice gradual climb, but soon got steeper and steeper (but maybe I was just tireder and should have eaten by then) and went on forever. I saw quite a few people riding back the other way and initially thought they were gluttons for punishment and wanted to ride up a second time, but in retrospect I think they were heading back either for timing reasons or frozen reasons. I recognized a friend from Portland heading down and she said she was following after a hypothermic friend rather than wait for an ambulance with him at the top of the hill. Eek. I let Pixie run alongside me a couple times so she wouldn’t get bored. Also, even though she only weighs nine pounds, having an empty basket is nicer for hill climbing. Having a cheerful little dog pull you up the hills is nice, too. I’m not sure I’ve ever seen him in long sleeves, come to think of it. He was contemplating turning back at this point because he wasn’t sure about wanting to do all the road riding at the end in the dark. That gave me pause. I really wanted to do the whole thing, but I was worried about my two friends in the rental car being done hours before me and having to wait. 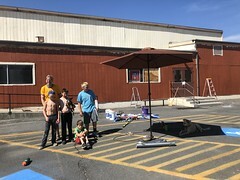 I figured they could find me another ride with all that time if it was a problem (we were driving 20 miles from The Dalles to Hood River for night two). I had figured I’d ride the entire thing alone and had the Ride with GPS route saved on my phone and an external battery pack because my phone tends to conk out in the cold (I also have a The Plug but I never use it because I have to turn off my light and go 10 mph). However, I ran into four friends who had stopped to eat at the top of the first peak! Aaron with the yellow fenders is from Portland and we have a bunch of friends in common though we’d never met before. Wang, Mohawk Mike, and Mark I know from Seattle. They’re all quite a bit faster than me, but waited up for me (or stopped for snacks) repeatedly so I wasn’t alone after all. While it would have been fine riding alone, it was awesome riding with friends. And after that we saw Stonehenge. 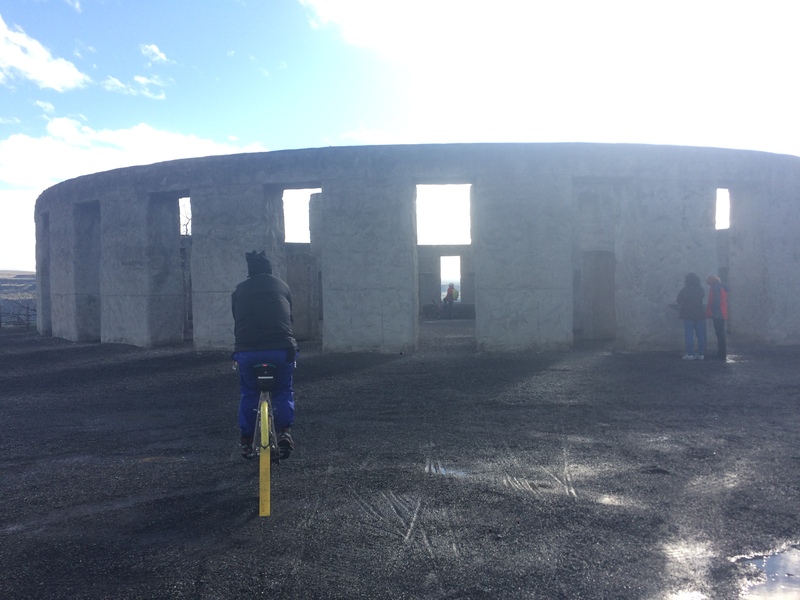 Yes, there’s a Stonehenge in Washington! And shortly after that we crossed back into Oregon and stopped at the gas station in Biggs Junction, figuring it’d be quicker than McDonalds (and thank goodness, I haven’t been to a McDonalds even since before watching Super Size Me). I bought a sandwich despite having lots of snacks left and filled my water bottles with water from the soda dispenser. And peed. I was curious how pee breaks would work. Pixie was fine on the side of the road, but I was happy I didn’t have to go until reaching Biggs Junction. 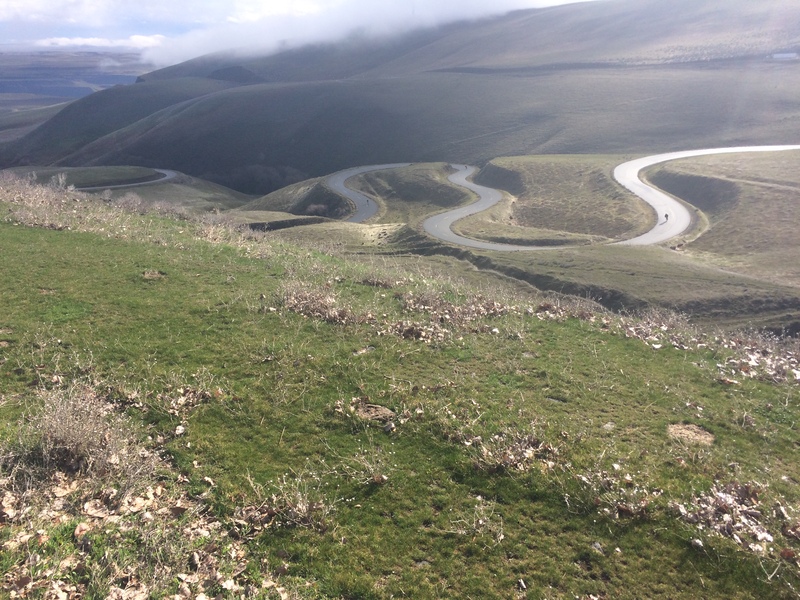 I sent a message to my travel buddies to let them know how far back I was and planted the seed that if they were impatient and wanted to scoop me up from the road, I wouldn’t feel cheated since I’d already done the first big hill and the loops. Soon after Biggs we found more dirt! 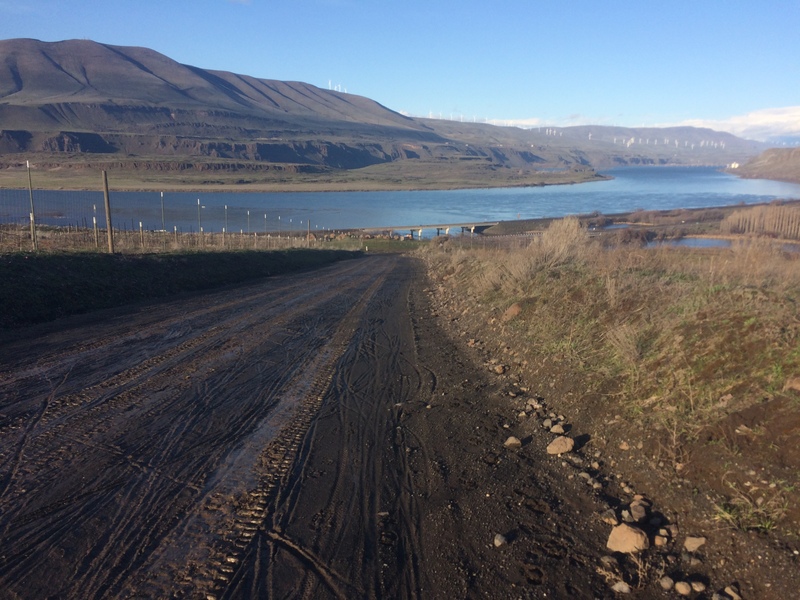 Not gravel this time, but toothpaste-like sandy mud on Old Moody Road. I’m not sure I would have fared better had this been the first hill of the day, but given the long day in the saddle it was tough! I walked all the uphill parts. But it was beautiful! 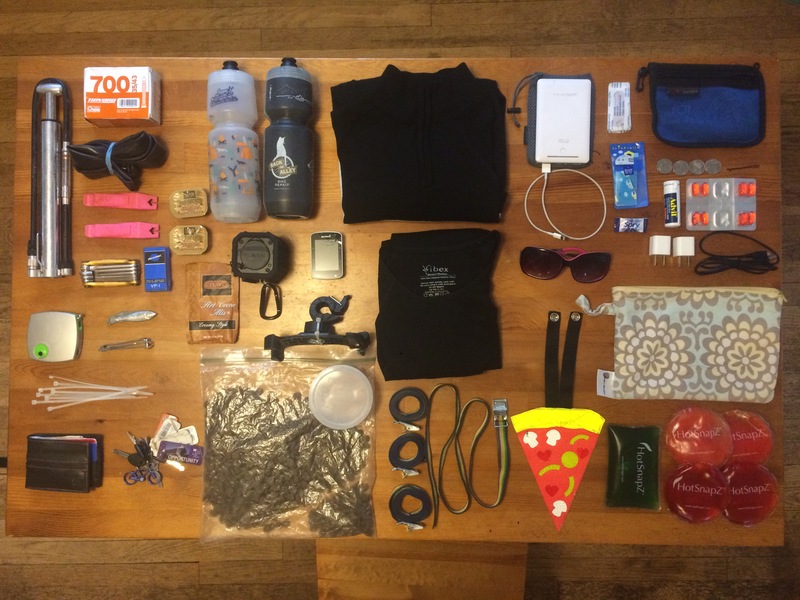 And I thought a lot about bike weight and packing while trudging along. I also checked for messages from the car crew when I had a signal. The passenger found a ride ahead of us and the driver was happy to wait. I have to admit once I suggested the possibility of a ride it started sounding enticing, but I’m glad I got to do the whole thing. Also, he got to meet a lot of people as they arrived to Holsteins after him/before me so that’s fun! 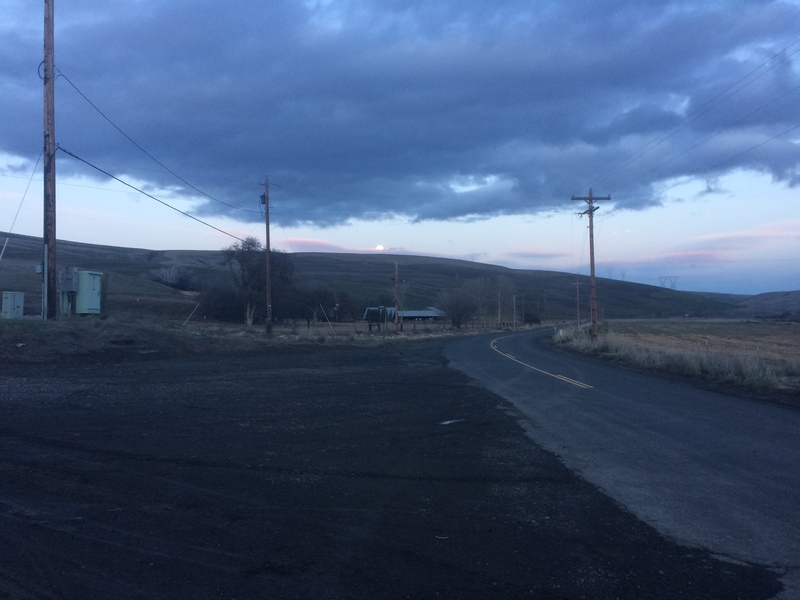 The full moon rose just as we got to the end of the gravel and followed us along Fifteen Mile Road. It was beautiful, but also a bit disconcerting as it masqueraded as a headlight during the occasional glance over a shoulder to see if there was a car back. Speaking of cars, there were very few all day. We biked past a construction site on Old Moody and I saw trucks head out downhill after we had passed it, but our timing was such that we didn’t have to share the road with them (and two slow-moving trucks coming towards us wouldn’t have been a big deal). A few miles into the day, someone yelled at me to “Get on the sidewalk!” as I biked over the bridge all alone (I doubt anyone opted to ride on the debris-strewn sidewalk), but there were no other incidents and it was a lovely low-car-traffic route as a whole. Shortly after moonrise I had to put Pixie in her backpack because she finally got fed up not being at the front of our pack (she’s a born pack leader, of course) and she was able to sit calmly in the backpack whereas the front basket just made her whiny. And this meant I hadn’t brought the backpack along in vain! That was with about 10 miles left. I had a lot of leftover food…but I like to share and I don’t like to worry about not having enough food. Plus I bought that sandwich at the 35-mile stop. In addition to that photographed above, I also had two little peanut butter tubs and a hot chocolate packet taken from the hotel’s Free Continental Breakfast I figured I could pass along to someone bonking on the side of the road. 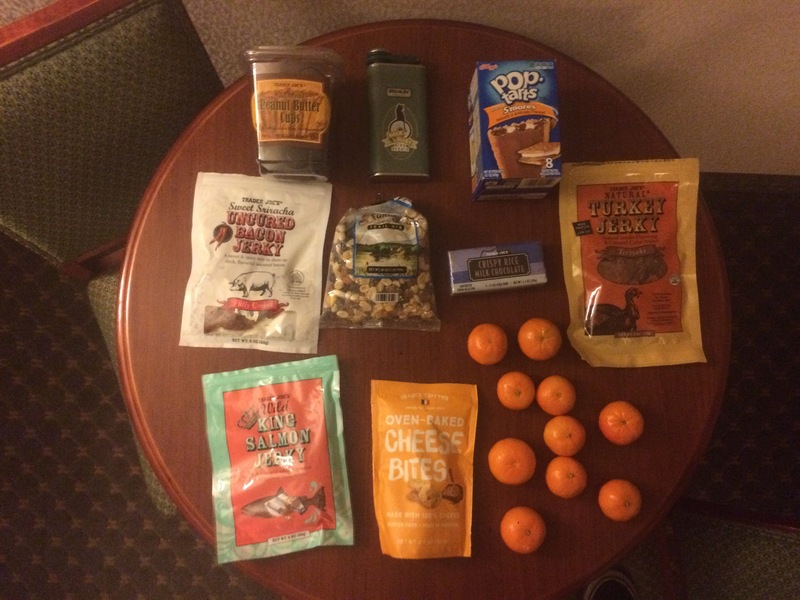 I guess I could have made do with half the peanut butter cups, only the salmon jerky, one chocolate bar, and two oranges (and the purchased sandwich). Of course I’d still bring the multitool and flat-fixing stuff. But I guess I could leave all that other stuff behind. 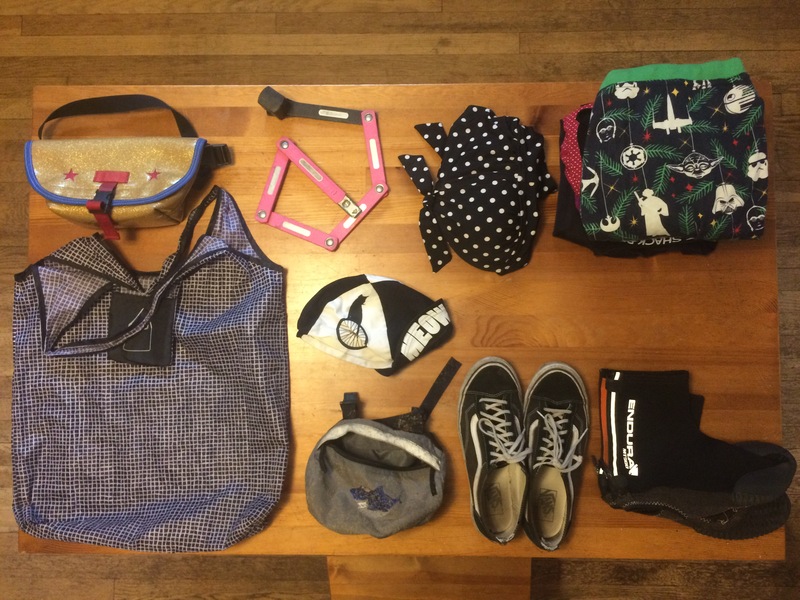 Obviously no Pixie would mean I’d have all my basket space for a sensible amount of snacks and minimal gear. Perhaps that would go in the BYOBB (many poeple use these for non-dog stuff, but mine has a special doggie head hole…but with a flap so I can close it for non-dog purposes). I think I’d still want a cargo net strapped to my rear rack because it would be convenient for quickly shoving clothing layers into. The handlebar mittens look big, but they’d go nicely onto the rear rack for too-hot periods. It’s tempting to try to “look the part” without fluffy handlebars were I to travel lighter, but it’s really nice to have warm and dry hands! I think I did OK on clothing. 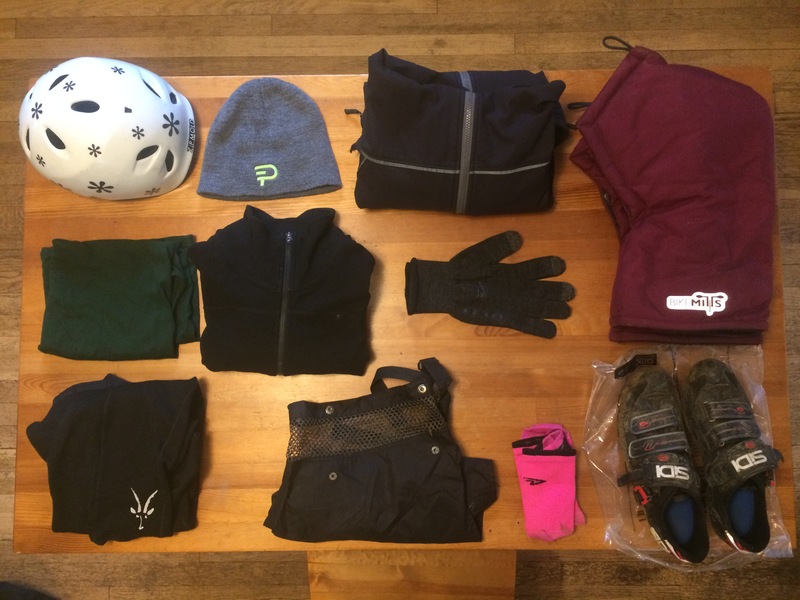 I have a thinner (but too large) rain jacket, but I need to re-waterproof it before I bring it on a ride like this. I need to re-waterproof my rain chaps, too, come to think of it. It was nice having somewhere to stow this stuff! Other than the bike lock it wasn’t heavy, but it was bulky. If I do this again, I’ll want to be able to stow stuff again. So that’s that! 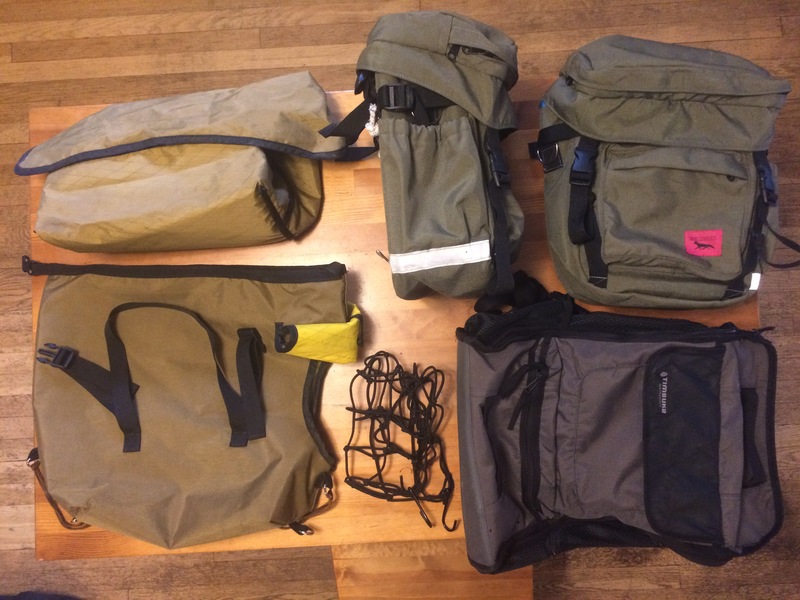 Any gear suggestions, both for traveling with dog and without are welcome.